Beautifully engraved certificate from the Mills & Gibb Company issued in 1900. This historic document has an ornate border around it with a vignette of an eagle. This item is hand signed by the Company's President, John Gibb and Treasurer and is over 105 years old. The company was a wholesaler and was famous for being on the RMS Titanic's Cargo Manifest as Mills & Gibb, 20 case cottons 1 case gloves. Many times Bonds were Payable in Gold or Gold Coin to give the impression that they were a more secure investment. In reality, they were not more secure since there wasn't any gold set aside as collateral for these bonds. On April 5, 1933, President Franklin D. Roosevelt signed Presidential Executive Order 6102 which invoked his authority to make it unlawful to own or hold gold coins, gold bullion, or gold certificates. The export of Gold for purposes of payment was also outlawed, except under license from the Treasury. On January 30, 1934, the Gold Reserve Act became law which made the ownership of gold illegal except for coins of numismatic value. 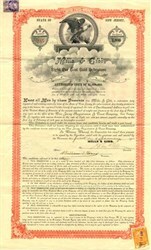 As a result of this law, Bonds were no longer allowed to be Payable in Gold.